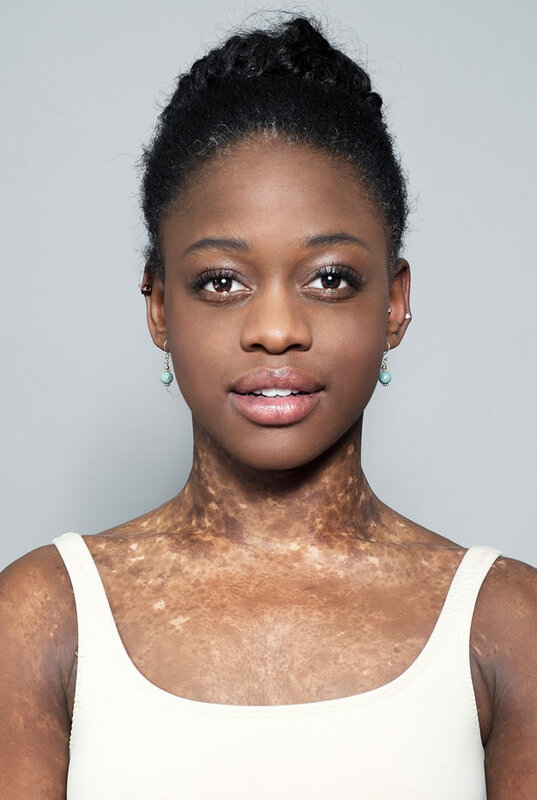 Michaela DePrince was born in war-torn Sierra Leone during the country’s decade-long civil war. Rebels killed her father, and shortly after her mother died of fever and starvation. Michaela had vitiligo, a disease that causes patches of skin to lose its color. In Michaela’s native land vitiligo was considered a curse of the devil. This caused her uncle to abandon her at an orphanage. There she was taunted and abused by the women who cared for the children. They called her the devil’s child.One day Michaela found a magazine blowing in the wind. On its cover was a photograph of a beautiful ballerina en pointe. Once Michaela saw this she found hope and determination to one day become just like that ballerina. Soon after the discovery of the magazine, an American family adopted Michaela, and she became the eighth of their eleven children, nine of whom were adopted. Michaela’s new parents recognized her talent for ballet. They enrolled her in ballet classes and supported her passion for the art. While attending the Rock School for Dance Education in Philadelphia her participation in the Youth American Grand Prix gained her a grant to study at American Ballet Theatre Jacqueline Kennedy Onassis School, in New York. Michaela worked hard to develop her skills so that she could overcome stereotypes of conventional beauty and racial barriers in the world of ballet.After Michaela was featured in the ballet documentary, First Position, Michaela debuted professionally as a guest principal at the Joburg Ballet in South Africa and appeared on Dancing with the Stars. She graduated in 2012 and at the age of seventeen joined, the Dance Theatre of Harlem. At eighteen Michaela started her career in the Netherlands as a member of the newly formed Dutch National Ballet’s Junior Company. In August 2014, she transferred to Dutch National Ballet, in the rank of élève. One year later, she was promoted to coryphée and in 2016 to grand sujet, and then to soloist at the end of the same year. Now at the age of twenty-one, Michaela has completed her second year with the main company, and has been promoted to the rank of Soloist for the Dutch National Ballet’s main company for the 2016-2017 ballet season.